Makes a Fine Dessert Wine! Catawba Grape is a slipskin variety favored by wine makers. Your Catawba Grape will arrive in a gallon pot, ready for planting. With its complex flavor of sweet mingled with notes of subtle spice, Catawba Grape makes a wonderful wine that's best enjoyed with dessert. It also makes a delightful sparkling vintage, as well as being tops for juice and jelly. 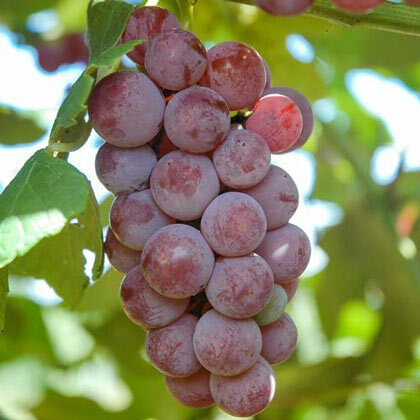 Purple-red grapes are firm and round with a pleasant aroma that attracts plenty of pollinators to the trailing vines. Fruit appears in medium to large clusters and matures late in the season. Plant grows to 15-25 ft. in length and creates a nice ornamental screen when trained over an arbor or trellis. Potted. Zones 5-7. Flower FormSmall, 5 petaled, held in narrow panicles. Not ornamental. FruitFruit appears in medium to large clusters. Round dull purple-red grapes. Soil RequirementsMoist, well-drained, slightly acidic soil. PruningDuring late February or March, proper pruning will help maintain a grapevine's potential of producing a good quality fruit crop, develop good vine structure, increase sunlight exposure into the canopy, promote the development of next year's fruiting wood, and potentially reduce disease and insect pressure. CommentsWith its complex flavor of sweet mingled with notes of subtle spice, this slipskin grape makes a wonderful wine that's best enjoyed with dessert. It also makes a delightful sparkling vintage, as well as being tops for juice and jelly. Purple-red grapes are firm and round with a pleasant aroma that attracts plenty of pollinators to the trailing vines. Fruit appears in medium to large clusters and mature late in the season. DepthPlant at the same depth it was planted at the nursery.